Pirates at last! 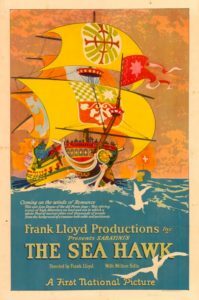 The Sea Hawk features Wallace Beery as a piratical rogue a full ten years before his star turn as Long John Silver in Treasure Island. Here he also plays a loveable villain named Captain Jasper, opposite star Milton Sills as Sir Oliver Tressilian, who I’m convinced was cast mainly for his burning gaze and the fearsome way he slowly clenches his fist when contemplating revenge on his betrayers. The story is based on Rafael Sabatini’s 1915 novel, which had been revived in the wake of the worldwide success of his Scaramouche and Captain Blood. This film hews much more closely to the novel than the later version with Errol Flynn. It tells the story with an old-fashioned melodramatic staginess that was already going out of style, especially in the movie’s first act, an Elizabethan soap opera (with dueling) that sets up why Tressilian, one of the queen’s former “sea hawks,” gets himself shanghaied onto a pirate ship. That’s when the rapscallion Beery enters the picture, and the real fun begins. Suddenly, sea battles! And not filmed with models or miniatures, either, they built real ships for this, a barque and two galleys, and the clashes between them are pretty spectacular. Betrayed in England, made a galley slave by Spain, Tressilian renounces Christianity and joins the pirates of Algiers to take his revenge on the world. He becomes a corsair captain, and in due time he captures the rogue Beery who originally captured him. The two join forces, and rascally antics ensue. Also alarums, excursions, abductions, impersonations, leering lechers, spying eunuchs, and vengeance-turned-to-ashes-in-one’s-very-mouth. That slow and stagy start? All is forgiven.